for $399,000 with 6 bedrooms and 1 full bath, 2 half baths. This 2,575 square foot home was built in 1917 on a lot size of 0.3042 Acre(s). 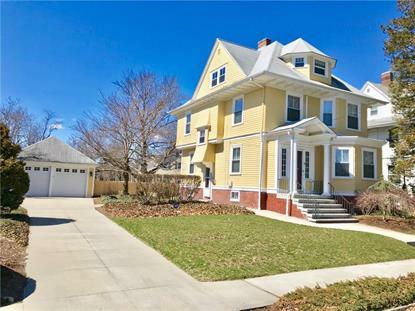 Stylish turn of century Victorian conveniently located to downtown, Brown, RISD and J & W. This quiet tree lined street welcomes you home to 3 levels of living space set on oversized lot in Edgewood. As you enter the foyer, you will immediately notice the grand staircase with period detail of surrounding built ins, window seat and hardwoods. A grand double parlor is perfect to welcome and receive your guests while dinner is prepared in the newly renovated kitchen with granite countertops, stainless appliances featuring Viking stove. The rear sun room offers panoramic views over the newly fenced- in yard with patio, surrounding the beautiful beech tree. Upstairs you will find four generous sized bedrooms with renovated full bath and laundry conversion. To the top floor for two more bedrooms perfect for guests, home office or master suite conversion. Updated mechanicals, heat, 2 car garage and air conditioning make this home a perfect choice for those looking for turn key.